1975 World Cup had 15 matches including the final. But only two of them were fought closely. In both of them West Indies emerged the deserving champion winning the first one with unbelievable last wicket partnership of unbeaten 64 runs, while it’s fielding won them the final. No surprises, that it emerged as the only undefeated team and Champion of the first Cricket World Cup in 1975. The match between Pakistan and West Indies provided a one wicket win for the champions, while the final they won by running out 5 of the Aussies, who were well on course to chase 292 runs. India lost to New Zealand by 4 wickets as the Kiwis managed to reach the target with only 7 balls remaining. 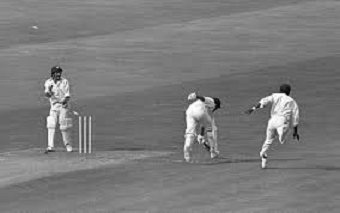 The first semifinal between England and Australia provided a low scoring thriller where after being bowled out for 93 runs, the host English bowlers scared Aussies by grabbing 6 wickets for only 39 runs, but Doug Walters (unbeaten 20) and the best bowler of 1975 World Cup Gary Gilmour (unbeaten 28 runs) ensured the ticket to final as they took Aussies to 4 wicket. Pakistan played West Indies in the 8th match of the tournament, in Group B. Before the match both had played a match each where West Indies had trounced Sri Lanka by 9 wickets, while Australia had an easy win over Pakistan by 73 runs. Winning the toss, Pakistan captain Majid Khan elected to bat. The Captain who opened the innings scored 60 runs and with 55 from Mushtaq Mohammad and 58 from Wasim Raja they reached 266/7 in 60 overs. Sarfaraz Nawaz shocked West Indies with three quick wickets as West Indies were left in danger at 99/5. Captain Lloyd scored 53 but was surprised by debutant Javed Miandad. The score soon read 203/9 as Sarfaraz took his 4th wicket. With the defeat imminent, wicketkeeper Deryck Murray (unbeaten 61) and Andy Robers (unbeaten 24) kept patience and added remaining 64 runs to register a morale-boosting victory for West Indies. 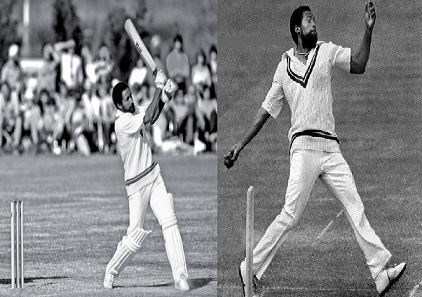 Interestingly, West Indies fielders who won them the final also effected two run outs in the match catching the two Pakistani debutants Javed Miandad (24 runs) and Pervez Mir (4 runs) out of crease.